I did this on my 04 silv and love it so far. The only thing I want to do is space out the booster some so it takes up the 1/2" of play before the braking starts, but thats no big deal. I have locked up my tires (well, the abs kicks in anyway) and dry road going 60mph and wouldve face-planted into the windshield if I wasnt wearing my seatbelt. Pedal effort is near nothing and is much smoother and more liner whereas with the vacuum setup you felt like even though you were pressing harder you werent stopping any faster - not the case with hydroboost, the harder you press on the pedal, the more force it exerts on the calipers, and the faster you stop, period. I do have 14" powerslot rotors, with hawk pads front and rear, and stainless brake lines, so that definately helps as well. I would say I can stop better than stock now, even with my tires that are twice as heavy. This is definately a worthwhile mod. So that comes out to about $185, which if you can get it without the master cylinder your down to $150, but most places sell them together. If you cant get the hoses like I did, rockauto sells them for around $20 each (3) and autozone/advanced around $45 each. Which comes out to around $1032...yea...no thanks. This is basically all you will need. This is assuming you are going to T the low pressure return instead of buying a new pump. If you get the new pump just plumb the return to that fitting instead of T'ing it. Unbolt the master cylinder from the vacuum booster unit with the 2 screws on the side. They are 15mm I think. There is only two and its not hard to get to. There is no need to remove the master cylinder since the vacuum one will work fine with the hydroboost one. No need to take it off and have to worry about getting air in it, so once you un bolt it just move it out of the way being mindful of the hardlines. Whatever you do, do not bend them where they crimp or youre in for a big headache, they will give some, but be mindful. -The easiest way to get it off is put a screw driver inside, turn in 90 degrees and slide it down and off. It is key shaped so you have to slide it down to get it off. Its kind of a pain, but stick with it. Remove the brake pedal and 4 bolts that hold on the vacuum booster. -This is the hardest part about this conversion. If you have big hands and shoulders like me it makes it difficult to maneuver in there and get those out. An air ratchet would be invaluable. 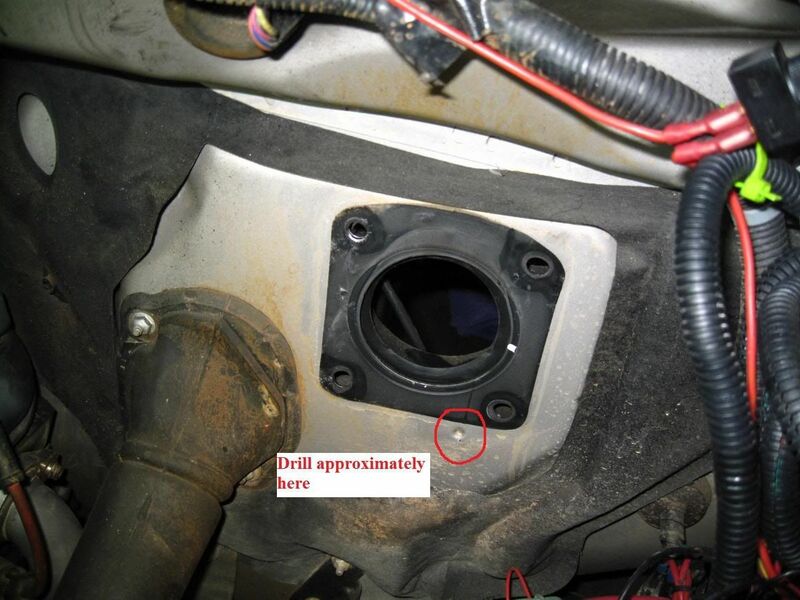 Remove vacuum booster and drill hole in firewall for the offset bolt of the hydrobooster. 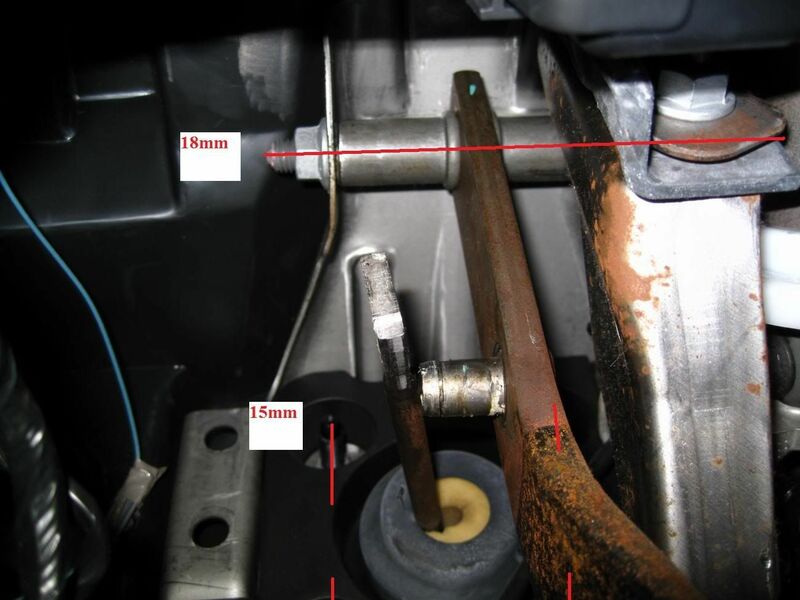 -Once you remove the nuts from inside and disconnect the rod from the pedal, there is nothing holding the vacuum booster on so with some wiggling it will come right out. Put it aside and sell it on ebay, you will no longer need it. -Now you may notice that your hydrobooster has one offset bolt from the other 3. You have two options: either drill a hole in the firewall where there is a dimple (see above pic), OR try to press out the offset bolt and drill your hydrobooster mounting plate. I tried to press the bolt out but wasnt having any success so I drilled the firewall. Either option works fine, except if you drill the firewall you will need to cut come rubber to place the nut over the bolt, or leave it un-nutted (ha), your choice. Once you have the hydrobooster mounted in place you can now bolt it up from the inside and install your hydroboost pedal. Notice the position of the rod stud in comparision with the top of the pedal. If you kept the stock pedal, your pedal would stick out past where it should be making it very uncomfortable and difficult to press. 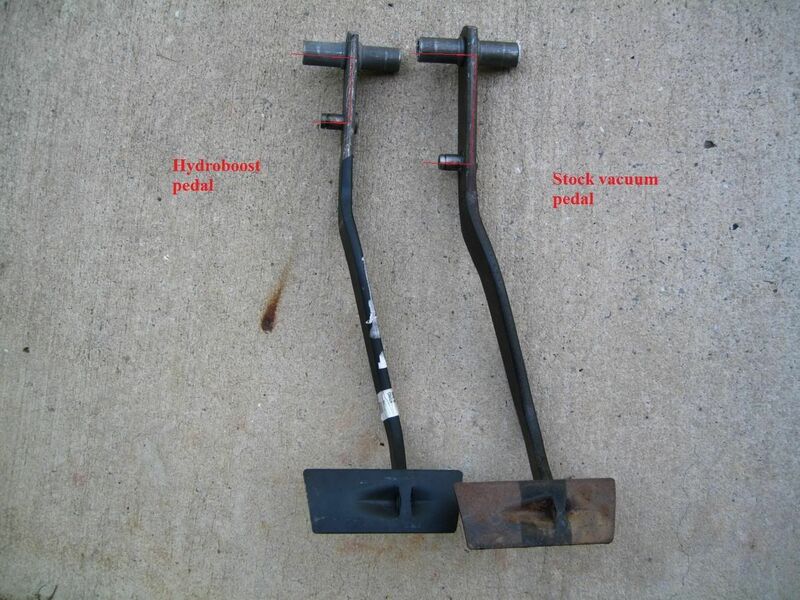 It is in your best interest to buy the pedal since modification of the rod will most likely destroy your booster. -The mounting bolt for the pedal only goes in one way, right to left (nut on left side), so dont sit there for 10 minutes wondering wtf is going on before test fitting the bolt without the pedal in the way and realizing you had it backwards the whole time, mmk? 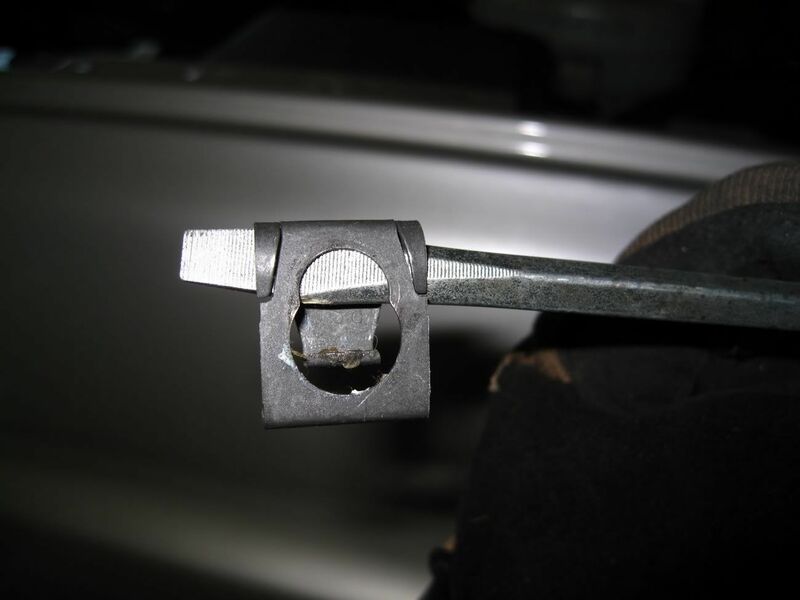 -Reinstall the brake sensor and rod to the pedal using the clip you removed earlier, except this time you press it over and slide down so its locked in place. 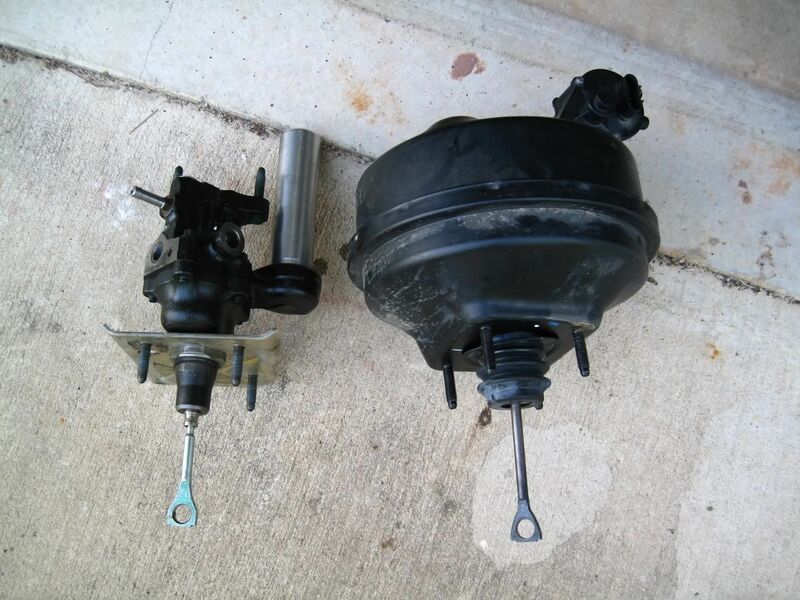 Attach the master cylinder to the hydrobooster the same way you took it off. Dont forget the brake line holder thing when you bolt it back on, it goes between the MC and the nuts. So at this point you have the pedal installed, and hydrobooster and master cylinder installed and ready to go, and now you need to run the lines. Remove the power steering pump so you can get to the back to where the hose attaches and attach the hose that goes to the booster. -Supposedly you might be able to get to this from the bottom without removing it, but I have a belly pan from my lift kit so I cant access the bottom. Either way, I think just removing it is easiest. 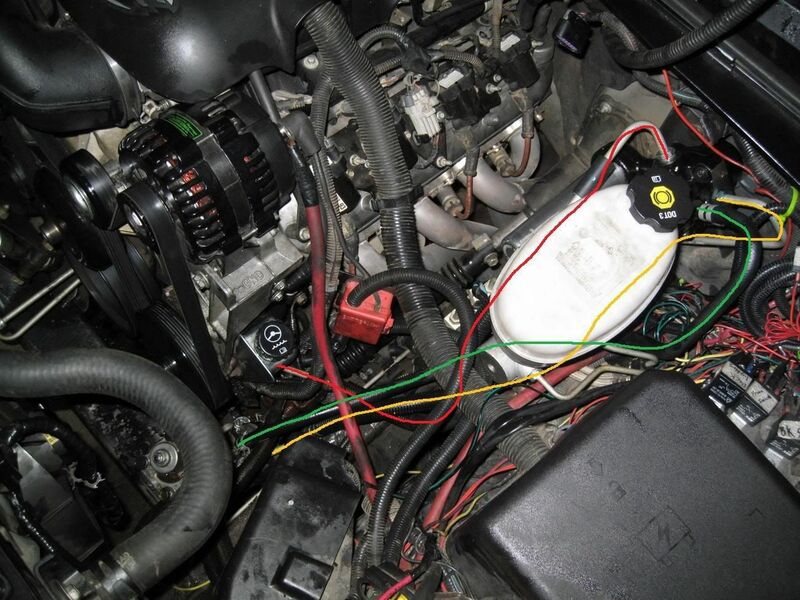 -I am going to assume you are doing this swap and have made it this far you know how to remove the serp belt and use the puller on the pulley to get it off, so I wont go into detail on that. I will add that I had to hold the pulley with my hand so it wouldnt rotate while I was pulling it. Depending on what type of puller you get, you may be able to use a creasent wrench (or bigass wrench if you have one) on the puller to hold it still. Same with the tool to push it back on, which with that one take care to make sure you have plenty of it threaded into the pump before cranking down, otherwise you will destroy the outer threads which means new waterpump. - Once you get the pulley off, its 4 15mm bolts, 3 on the front, and 1 on the side, to get the pulley off. One of the bolts is to a bracket that holds some electrical lines out of the way, it is easiest to remove this and make removing the pump easier. - Now the pump shouldnt be attached by anything but the lines. You now need to turn it over to get to the back since thats where the hose attaches. I found the easiest way to do this was finagle it upwards so its near the alternator. You will have to maneuver around electrical wires and hoses, but it is doable once you get that angle you need. You will need to remove the hose that comes out of the back and goes to the gear box. - When that hose is removed, install hose number 6 from the parts picture at the top. The end with alot of bends goes to the pump. It will be obvious since these bends allow the hose to be routed safely around everything. - Reinstall the pump the same way you took it off. Dont forget that ground wire on the side bolt or the bracket on the front. Press the pulley back on and reinstall the serp belt. Attach the hose that goes from the gearbox to the booster. 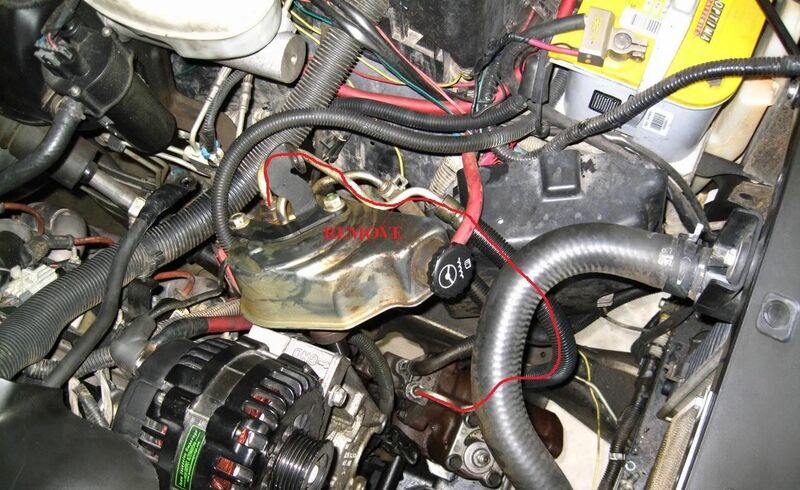 - This is hose number 7 in the parts picture, and the end with the 7 on it goes to the gear box. 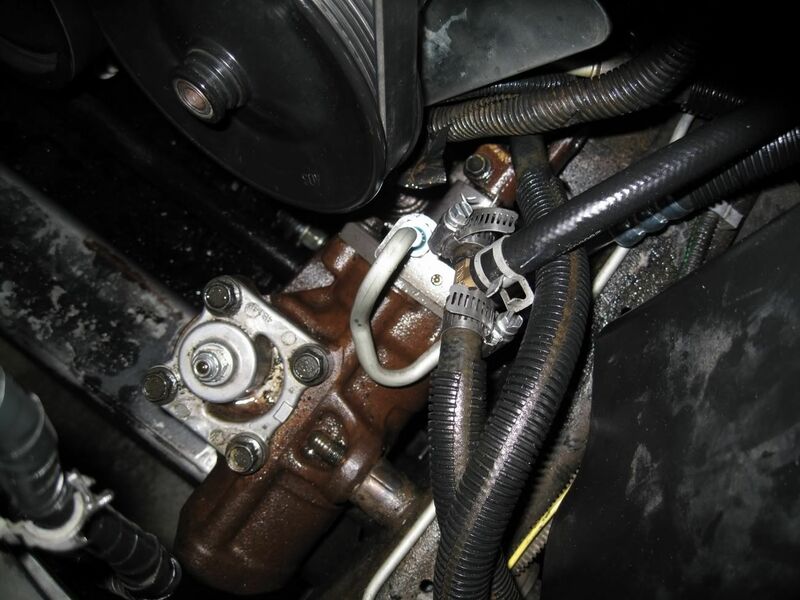 - There will probably be a little bit of fluid leaking out from the top of the gear box but that is why you bought you more fluid and it will stop as soon as you connect the hose. The hose has different size fittings on each end, so you cant install it backwards. - Once it is connected to the gearbox, you can attach it to the driver side of the booster. 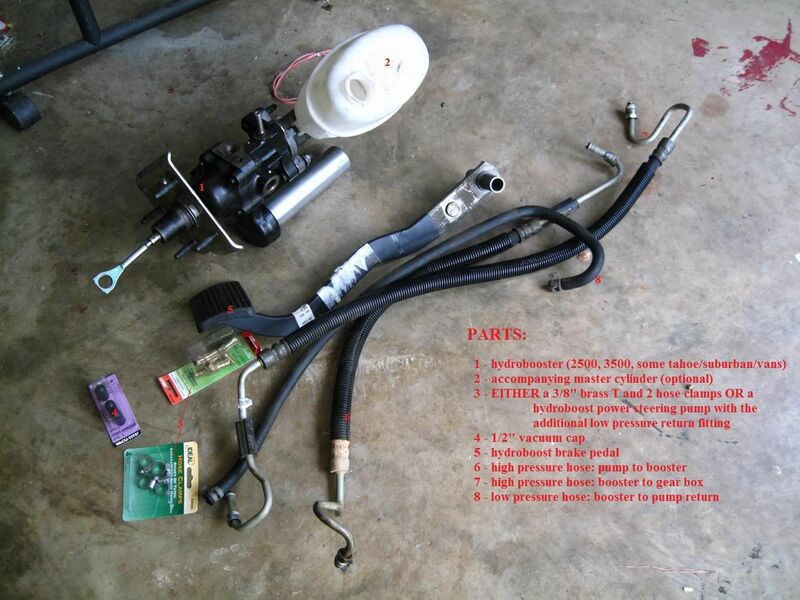 - Attach the hose from the power steering pump to the passenger side of the booster at this time as well. T low pressure return from booster into low pressure return to pump. - This line is very low pressure, as in a few tablespoons when you let off the brakes and a slight drip whenever else, so this is why you can T this without a problem. - You can either attach it right before the pump after the cooler, or right after the gear box before the cooler. I chose to do the later. - I used a razor blade to cut the line (make sure you cut it straight!) about 6" from the gear box to give the fitting enough room, and attached my 3/8" T fitting in between the two halves I just made and secured it with clamps, making sure the perpendicular side of the T was facing the booster. The flow from the gear box to the cooler should be a straight line - use the offset prong for the booster return. - I ran my low pressure return line to the open prong and secured it with a clamp. 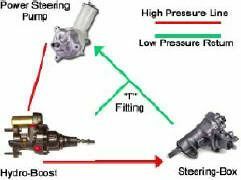 Bleed the power steering. Do not start the engine yet. - The easiest way I've found to do this is jack up the front of the truck so the tires are off the ground and turn the steering wheel full left to full right about 20 times, checking every few times on the fluid level. Also pump the brakes a few times as well. The fluid should be around "full cold", if not, add more. - Having too much fluid is just as bad as not enough, so DO NOT exceed the "full hot" mark and make sure there is more than the "add" mark. Somwhere in the middle is where you want, close to the "full cold". - Once you have cycled the steering back and forth and you are no longer getting bubbles in the resovoir, you are ready to start the engine. Double check all fittings and connections, say a quick prayer, and start the engine. - The system should be pretty well bled, but its never a bad idea to cycle the steering wheel some more just in case. - Press the pedal a few times to make sure your brakes actually work (you can hear the engine studder slightly due to the increased load on the pump). That is all there is! Typical install time will be 3-6 hours depending on how fast you work. It took my 3 days because my hydrobooster was retarded and had to be wacked with a hammer before it worked properly (seriously), but if it wasnt for that I would have been done in 4 hours.